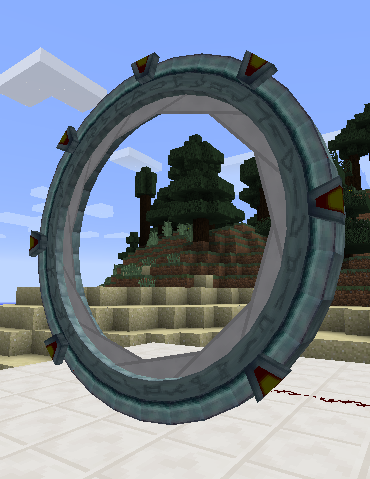 A stargate is a transportation device developed by a long-vanished alien civilisation known as the Ancients. Their vast network of stargates was later taken over by the Goa'uld, a race of nasty sentient parasites. The Goa'uld brought stargate technology to Earth, enslaved the ancient Egyptians, and then largely lost interest in us. The only traces remaining of them on Earth now are their influence on Egyptian culture and a few pieces of mysterious technology. How the stargate works is not known in detail, but it appears to create a space-time wormhole linking it to another stargate in a distant location. Once the wormhole is established, a person can step into one stargate and be instantly transported to the other. A network of stargates is similar in some ways to a telephone network. Each stargate has an address, and you establish a connection by dialling the address of the stargate you want to connect to. Stargates are built from components that may be found in various places in the world. You will sometimes find stargate components in chests in dungeons and other structures, and occasionally you may even come across a complete stargate. Some components can also be crafted, but not all. In particular, the circuit crystals that form the heart of certain key stargate components are beyond our ability to replicate; these may only be found in the world or purchased from a Tok'ra villager. Note: Generation of stargates in the world is currently disabled by default due to incompatibility with some other mods. You can enable it by setting the augmentStructures configuration option to true. To create a stargate, you need to build a 5x5 ring composed of a Stargate Base Block, eight Stargate Ring Blocks and seven Stargate Chevron Blocks, arranged in the patter shown here. 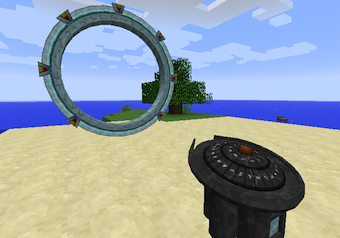 The blue circle on the base block should face the direction you want the front of the stargate to be in; the direction of the other blocks doesn't matter. Once the last block is placed, the blocks of the ring will merge together and form a Stargate. To use your stargate, you will need a Stargate Controller, also known as a DHD or Dial Home Device. The controller should be placed facing the front of the stargate, within 5 blocks of the bottom centre of the ring, either on the same level or one block above or below.If the controller is properly linked to a stargate, the central button will be orange. If it is grey, your controller is too far from the stargate or facing the wrong way. Right-clicking on the top of the controller will bring up a GUI for entering a stargate address. The address can be entered either by clicking buttons on the circular grid or typing letters on the keyboard. The Backspace or Delete key can be used to erase characters. Once a complete address is entered, press the Enter key or click on the orange button. If the address is valid, the orange button will light up and the stargate will begin dialling the address. Once a stargate connection is made, it can be disconnected by pressing the orange button again. A stargate address is made up of either 7 or 9 characters, chosen from an alphabet of 36 symbols. For convenience, these symbols have been mapped to letters and digits, so that you can write them down easily and type them on your keyboard. The hyphens are purely for readability – you do not need to enter them when dialling the address. The address encodes a dimension and a spatial location within that dimension. The location has chunk-level resolution, meaning that you can only have one useful stargate in each chunk (16x16 area). If you dial the address of a chunk containing more than one stargate, one of them will be connected to arbitrarily. To connect to a stargate in another dimension, you need to dial the full 9-character address. You can only do this from a stargate that has been expanded to 9 chevrons using a Stargate Chevron Upgrade. The stargate at the other end must also have 9 chevrons, because it needs to dial back to complete the connection. When you open a stargate's GUI, its address is copied to the clipboard, so you can then easily paste it into a book or other place. Before your stargate will do anything, it needs to be supplied with energy. Stargates run on naquadah, a dense mineral of unknown composition that is a very rich energy source. Naquadah is obtained from naquadah ore, which is most commonly found underneath lava, although it occasionally appears in other places. Due to its very high density, a diamond pickaxe is required to mine naquadah. The naquadah reactor that powers the stargate is located in the DHD. Open the fuelling interface by right-clicking on the grey panel near the bottom, and place naquadah in the fuel slots at the right. The black rectangle is a fuel buffer that will be automatically refilled as necessary from the fuel slots. Establishing a connection requires a fairly large burst of energy, and energy is also used as long as the connection remains open. Energy usage varies with the distance between the stargates, and whether they are in the same dimension or not. If you don't keep the stargate open for longer than necessary, one piece of naquadah is good for about 15-20 moderate-distance journeys to a stargate in the same dimension. Travelling a very long distance, or to another dimension, will use considerably more naquadah. If you leave a gate open, it closes automatically after 5 minutes. Fuel is only used by the stargate initiating the connection. No fuel is required to receive a connection or maintain a received connection. 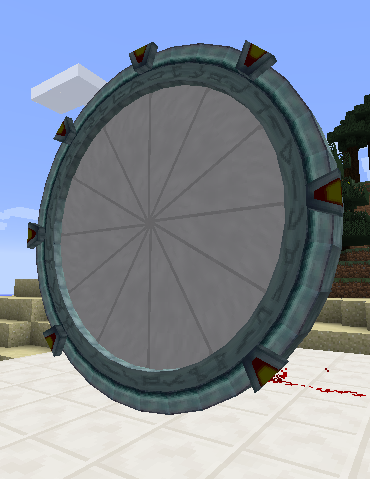 Alternative means of powering stargates are available if you have certain other mods installed. See Power Units. The Stargate Base Block emits a redstone signal whenever the stargate is active (dialling or connected). Example of a "buried" stargate achieved using the above arrangement of camouflage blocks. Once the upgrade is installed, it cannot be removed except by breaking the stargage base block, in which case the upgrade item will be returned. A stargate inside your base can be a fairly large security hole, since there is nothing to stop an enemy from dialling in and invading you. To guard against this, you can install an iris in your stargate by shift-right-clicking on the base block with an Iris Upgrade item. 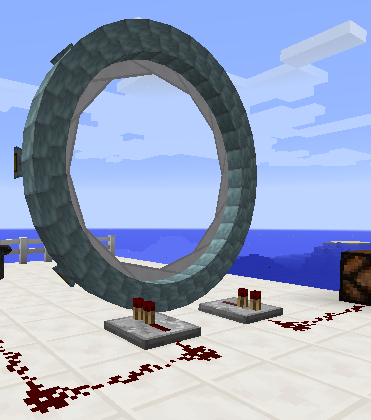 To close the iris, apply a redstone signal to the stargate base block or one of the blocks adjacent to it. When the iris is closed, any players or mobs coming through the wormhole will be instantly killed, and any items thrown through will be destroyed. If you are using redstone wires to control the iris or monitor the gate's state, you will need to insert repeaters as shown here, otherwise the signal emitted when the gate is connected will activate the iris. The opening transient of a stargate event horizon is extremely dangerous. It is recommended to maintain a distance of at least 5 blocks from the front of the stargate until the event horizon stabilises. Breaking a stargate while a connection is open is not recommended. The event horizon contains a large amount of potential energy; if the stargate mechanism is disrupted, this energy will be explosively released. automatically dials back to the initiating stargate.